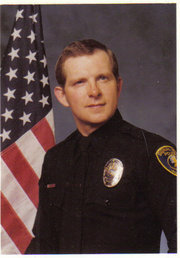 Police Officer Anthony Giniewicz succumbed to gunshot wounds sustained on February 19, 1985, during a shootout with three gang members at a local restaurant. He and another officer had just gotten off duty and were eating at the restaurant with a dispatcher and Officer Giniewicz's wife. The other officer left the restaurant to go home but as he walked to his car he was accosted at gunpoint and robbed of his badge and service weapon. The three gang members took the officer hostage. As they walked him into the restaurant he was able to break free and called out for help. Officer Giniewicz immediately came to his assistance, and after getting a description of the suspects, went outside. The suspects immediately opened fire on him when he came outside. He was able to return fire but was severely wounded. He became paralyzed from the chest down as a result of his wounds and remained in poor health until passing away as a result of complications on December 7, 2011. Officer Giniewicz had served with the Signal Hill Police Department for three years and had previously served seven years with the Massachusetts Department of Correction. He is survived by his son, two stepchildren, mother, and six sisters. Rest in peace Officer Giniewicz.